The LIVE facility at the Forschungszentrum Karlsruhe is designed to study the late phase of core degradation, onset of melting and the formation and stability of melt pools in the RPV. Additionally, the regaining of cooling and melt stabilisation in the RPV by flooding the outer RPV or by internal water supply will be investigated. 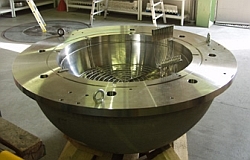 The LIVE facility consists of the hemispherical test vessel, a volumetric heating system in the test vessel to simulate the decay heat, a heating furnace to generate and pour the simulated corium melt, and a multitude of instrumentation to characterize the status of the melt. The test vessel is a 1:5 scaled RPV of a typical pressurized water reactor with no penetrations of the lower head, and is equipped with different measurement techniques like heat flux sensors and thermocouples. The hemispherical bottom is closed by an upper lid and different openings in this upper lid allow the pour of melt to the central region or close to the perimeter of the lower head. 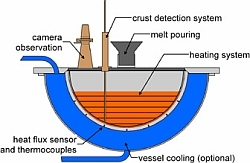 To investigate the influence of different external cooling modes on the heat flux, the test vessel can be cooled by water or air at the outer surface. For this purpose the test vessel is surrounded by a second cooling vessel. The cooling medium is injected at the bottom of the cooling vessel and leaves the vessel at the top. Commissioning tests in the LIVE facility have been completed in the beginning of 2006 The experimental program start in summerof 2006 and will consist of three different phases. In the first phase (LIVE1) the investigations will concentrate on the behavior of a molten pool, which is poured into the lower head of the RPV taking into account possible 3-d effects. The melt pool can be purely oxidic or, in a later stage, a pool with an oxide and metal melt. The objective is to determine the time dependent local heat flux distribution to the lower head, and the development of crusts, depending on internal melt heating and external cooling modes. Furthermore, the gap formation between the RPV wall and the melt crust as well as the role of phase segregation of a non-eutectic, binary melt on the solidification behavior shall be investigated. In the second phase (LIVE2) the experiments will be extended to allow multiple melt pours and the presence of water in the lower head. The third phase (LIVE3) will deal with processes during in-core melt pool formation, the stability of the melt pools in the core region during different cooling modes and relocation processes after crust failure. The experiments will be carried out with different simulant materials. The first melt is a binary mixture of NaNO3 and KNO3 with temperatures up to about 350 °C. This melt mixture shall allow, at a moderate temperature level, the basic phenomenological studies of the important physical processes in the lower RPV head. In an advanced stage, the second melt that can be used, is a binary mixture of V2O5 with CuO, MgO or ZnO with temperatures up to 900 °C. Additionally, in a later stage of the experimental program, the addition of metal components is foreseen. The simulant melt will be produced in a separate heating furnace and is discharged into the test vessel via a heated spout. The furnace is combined with a device to allow the extraction of the residual melt out of the test vessel back into the heating furnace to investigate the remaining melt crust. Experiments in the LIVE facility are part of the LACOMERA Project of the EU 5th Framework Programme. The produced experimental database will be used to validate and improve computer models, which are being developed in the area of molten pool formation and cooling in the lower head.